I have had Coffee, Tea, The Gypsy and Me by Caroline James sat on my to be read pile for a while now and I need something a little different from the current books I have been reading as it was starting to feel like all the characters from various books were merging into one and so flicking through my pile I decided to boost this one to the top to give it a try. Set in the 1980’s Jo feels like life has hit rock bottom as her partner has left her and their little son. Jo needs a challenge to make her get up in the morning and to make some hard earned cash to secure a feature for her son. When an opportunity arises for her to buy Kirkton House she doesn’t hesitate in buying it and transforming it into a hotel come restaurant. As we meet many guests coming and going through Kirkton House doors Jo soon starts to fear for the future of her business with the financial crisis hitting everyone she wonders how she wil make ends meet will she be able to carry on or will she have to sell? This was a great easy read I found myself clicking through the pages so much so that I finished this book in an afternoon! I loved Jo she was a very entertaining and ambitious character who was happy to muck in and get her hands dirty. I thought the friendship between Jo and Hattie really made this book, they are two poles apart but they form such a great friendship and both help each other out in times of need. Hattie managed to bring a great sense of humour to this book. The only problem I really had with this book was there were so many characters in this book, now the main characters were developed very well but the extra characters were not developed well enough to be able to remember who was who which may not have been a problem had they only turned up once in the book but once they were referred to again I couldn’t remember who they were and this was a little off putting. 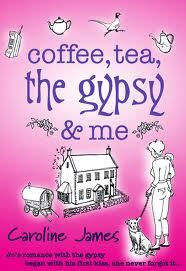 I loved the whole gypsy tradition which was included in this book the traditions and values that were included were true gypsy ways which gave the book a more realistic and informative approach for any reader who are not aware of Gypsy culture. In true fiction form the romance comes unbelievably quickly but the author manages to then create twists and turns in the relationships in this book to still keep you interested. I would have loved to see a little bit more of the renovation of Kirkton House just so it didn’t feel as though it had easy fallen into Jo’s lap. All in all I think this is a great read at a great price on kindle and well worth clicking to get your own copy.